Leading chemical companies have empowered 1,019 Indian farmers in their journey to create a framework for sustainable castor bean production. Arkema, a global leader in specialty chemicals and advanced materials; BASF, the world’s leading chemical company; Jayant Agro-Organics Ltd., a pioneer in castor oil based chemicals in India, and Solidaridad, an international civil society organization, came together for Project Pragati (Hindi word for progress). With this first-of-its-kind initiative globally, the companies are developing a sustainable castor framework titled SuCCESS (Sustainable Castor Caring for Environmental & Social Standards). 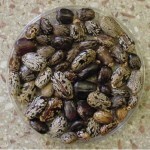 Castor seed prices rebounded by Rs 34 to Rs 4,470 per quintal in futures trading today on improved industrial demand. 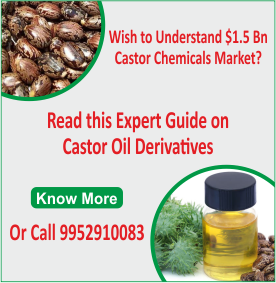 At the National Commodity and Derivative Exchange, castor seed for most-traded, delivery in August month gained Rs 34 or 0.77 per cent to Rs 4,470 per quintal, having an open interest of 74,470 lots. 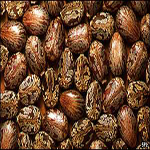 The castor seed for delivery in September advanced by Rs 33 or 0.73 per cent to Rs 4,540 per quintal, clocking an open interest of 13,760 lots. 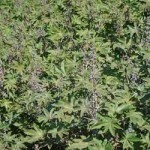 Castor seed’s market under pressure may get some support from the increased export of castor oil from the country as the export has been recorded at the upper level of about 13 months during April. 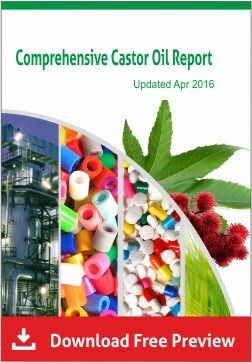 According to the SEA officials, during April, 55, 557 tonnes of castor oil has been exported from the country, which is the highest monthly export since March 2016. 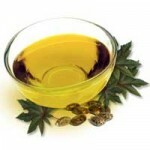 Wish to Purchase Castor Oil Derivatives from India? 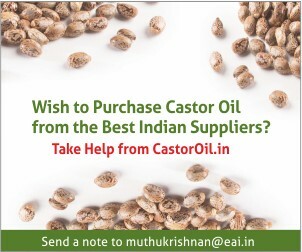 CastorOil.in provides quality assistance, especially for international companies, in procuring castor oil derivatives from high quality suppliers in India, who are also excellent in customer service and support. 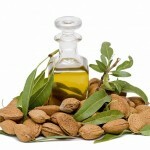 We work with a number of vendors, all of whom have already been evaluated by us for their quality product and service. We can identify the best vendor for your requirement from those in our list. 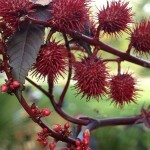 National Green Tribunal has ordered that companies using castor plants for commercial purposes will have to share monetary benefits with local communities. According to the rules manufacturers, whose turnover is upto Rs. 1 crore will have to pay 0.1% of it to Maharashtra State Biodiversity Board, while those having a turnover between Rs. 1 crore and Rs. 3 crore and a turnover above Rs. 3 crore will have to pay 0.2% and 0.5% respectively. The trend in castor seed futures for September delivery on India’s National Commodity and Derivatives Exchange (NCDEX) is bearish. On 20th August , support for NCDEX castor seed is seen at 3360 and 3310 levels while resistance is seen at 3440 and 3500 levels at Commodity Online. NCDEX castor seed for September delivery was seen trading down by 1.42% at Rs.3400 per 100 kgs. As of now, NCDEX castor seed is seen exhibiting bearish trend despite weak INR. Generally depreciation of INR against USD supports the commodities in the futures market. The trend castor seed futures for August delivery on India’s National Commodity and Derivatives Exchange (NCDEX) is negative and further downward movement is expected from current levels. NCDEX castor seed for August 2013 delivery was seen trading down by 0.32% at Rs.3480 per 100 kgs on July 18. National Spot Exchange (NSEL), India has confirmed having 1.04 lakh tonnes of castor seed stock at Kadi, Gujarat, with an overall storage capacity of 1.2 Lakh tonnes. NSEL said that the existing stock of 1.04 lakh tonnes is for 6715 participants who actively use NSEL’s online facility to trade in castor seed. 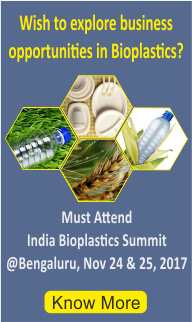 Further, there are four leading caster seed crushers, processors and exporters in India and Jayant Agro Organics and N K Industries are the leading exporters using NSEL platform.